Governor Cuomo has until September 6th to sign this legislation. He should sign it. 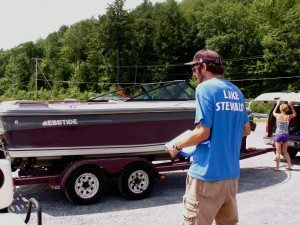 This legislation aims to prevent the spread of aquatic invasive species (AIS) by requiring the removal of visible vegetation and animals from boats and related gear, as well as draining areas of the watercraft of all water, when entering and leaving boat launch sites to various water bodies across New York. Laws that prohibit the transport of AIS are common throughout the U.S. Many states such as Minnesota, Vermont, New Hampshire, Washington, Idaho, Montana, California, Nevada, Utah, Colorado, Arizona, Massachusetts, and South Carolina, among others have similar laws. The Department of Environmental Conservation passed rules to ban launching of boats with AIS at over 200 public boat launches and fishing access sites in New York. This legislation covers public, private and commercial launches. It creates the state’s first comprehensive intervention and prevention program. A broad coalition supported this legislation including the region’s and state’s leading environmental groups, Trout Unlimited, the Adirondack Park Local Government Review Board, New York State Federation of Lake Associations, and many individual lake associations in the Adirondacks and across New York. This legislation was sponsored by Barbara Lifton (D-Ithaca) in the Assembly and Senator Thomas O’Mara (R- Chemung County) and will help to prevent the spread of aquatic invasive species (AIS) throughout New York. Here’s a joint letter of diverse partners that organized to support this effort. Enactment of this legislation into law will help to focus on prevention and interdiction of aquatic invasive species. This puts New York on track to be proactive to prevent the spread of invasive species rather than simply reactive to try and control new infestations of lakes and ponds. Boats transported around New York should be clean, drained and dry. The main vector for spreading AIS throughout the Adirondacks and New York is the transport of motorboats for public recreation. 460,000 motorboats were registered in New York in 2012. Tens of thousands of boats are transported across New York for public recreation for use on many lakes, ponds, and rivers. AIS attaches to the engines, hulls, and trailers, among other places, and are carried from one lake to another. In juvenile stages, microscopic AIS animals, such as Asian clams (Corbicula flumenia), quagga mussels (Dreissena bugensis) and spiny water flea (Bythotrephes longimanus), are transported in standing ballast waters, engine water and in live wells and bait buckets. Lake George and Lake Champlain were the first lakes infested with Eurasian watermilfoil (Myriophyllum spicatum) and curly leaf pondweed (Potamogeton crispus) in the 1980s. 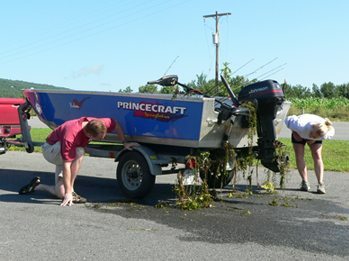 Their high popularity and high boat traffic, combined with the weak control efforts, resulted in spreading Eurasian watermilfoil throughout the Adirondacks. This same dynamic is at play once again, though the species have changed. 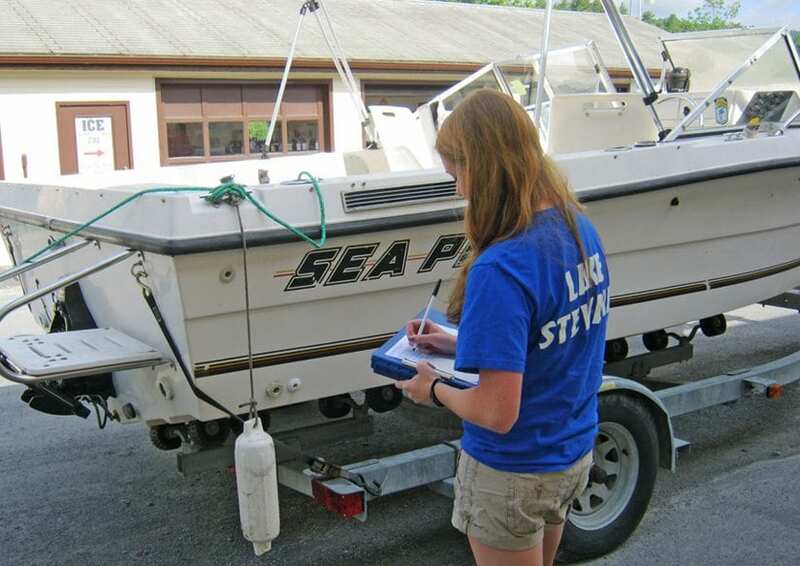 The Asian clam and spiny water flea infestations in Lake George raises the likelihood that this invasive species will be transported from Lake George to other lakes and ponds throughout the Adirondacks. In Lake Tahoe, the Asian clam infestation has resulted in transforming once blue and sandy beaches into places littered with clams shells and often covered with thick wads of algae. We cannot let this happen in the Adirondacks. Lake George has taken bold action to control new AIS infestations through a mandatory boat inspection and decontamination program. This is one of the best programs in the U.S. One problem is that Lake George is infested with five AIS. Boats that leave Lake George could be carriers of AIS unless decontaminated. Most boats that exit Lake George are not decontaminated. Upstate New York is an area rich in incredible lakes, ponds and rivers. The water quality of Upstate New York is vital to the local economies and supports a number of businesses, resorts, vacation homes, and high property values. AIS can rapidly change the ecology of a lake, wetland, pond or river as well as significantly impair and seriously diminish recreational enjoyment. A much greater investment is needed by New York State to prevent the spread of AIS in order to protect the Upstate economy, environment and quality of life. The Lifton-O’Mara legislation on Governor Cuomo’s desk will lead to comprehensive statewide action that is vital in New York because we still have places like the Adirondack Park, and other areas of Upstate New York, where the majority of the major lakes remain un-infested with AIS. Unlike most of the rest of New York, most of the major lakes and ponds in the Adirondacks remain free of AIS, but the number of infested lakes continues to grow. As more lakes become infested with AIS costs of control efforts rise. AIS control is very expensive, often beyond the means on lake associations, local governments and limited funding from the Environmental Protection Fund (EPF). Prevention and interdiction are far less expensive and will do much more to control the spread of AIS than the combined control and management efforts underway across New York. The days of dirty boating must end. The protection of lakes, ponds, and rivers from AIS infestation will help the economy and quality of life of Upstate New York communities. The Lifton-O’Mara legislation creates a strong new state regulatory infrastructure. Once this bill is signed into law, and after regulations are finalized, New York will need to develop hundreds of decontamination facilities and make sure that the major boat launches across the state have inspectors. It’s time to muster a greater sustained investment in the protection of water quality across Upstate New York. 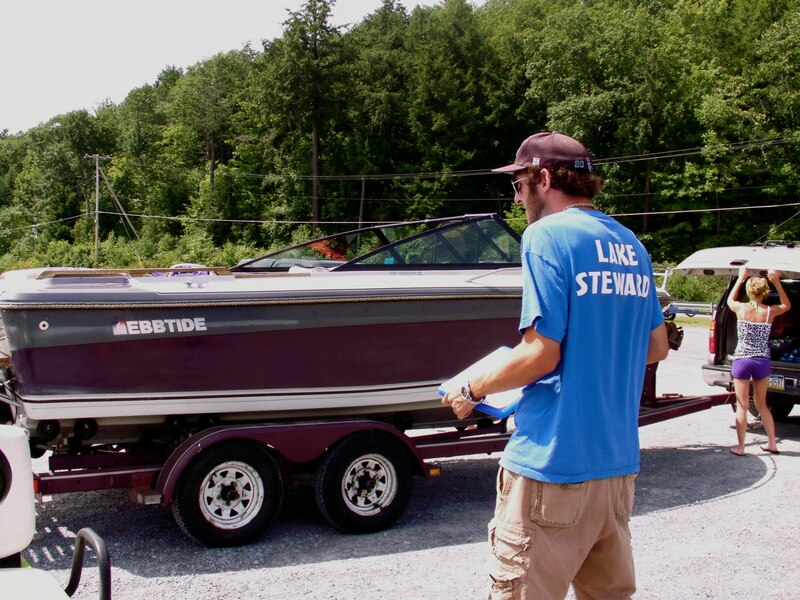 Photo: A Lake George Association Lake Steward inspects a boat for invasive species. Courtesy the Lake George Association Lake Steward Program. Peter, Why wouldn’t he sign it? Is there reason to think he might not? This article makes me wonder what is up? Before or after the indictment? What is the Lieutenant Governor’s thoughts on the matter? I think the best way to fight AIS is to change the culture of recreational boaters much the way the culture of hikers were changed in the high peaks. Through education the summit stewards have allowed the plant life in high elevations to rebound dramatically. Signing the law will not stop the threat but I think it would go a long way in helping change the culture. Sign it governor!